I wanted to add a new item to this list, and take a couple of things off. I want to thank those that helped in the identification of the ceramic bird cage water dish. I think we can safely say that this item was part of a prisoner’s keeping a pet bird in the block. I need to leave the medical syringe plunger top, for I still have no good documentation for why there is an embossed F on the top. From time to time an artifact is discovered at Johnson’s Island that I can’t identify. Most times I can figure it out without too much difficulty, but once in a while the identity alludes me. I decided to share some of those finds with you, hoping that someone would know what these objects belonged to or how they were used. Leave a comment below if you have ideas! 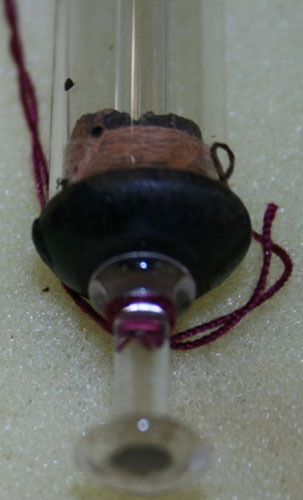 The first item we have presented before as the top of a plunger for a syringe. It has the letter F embossed at the top. The example to the right was photographed at a Civil War “show” where examples of various types of Civil War materials are exhibited. 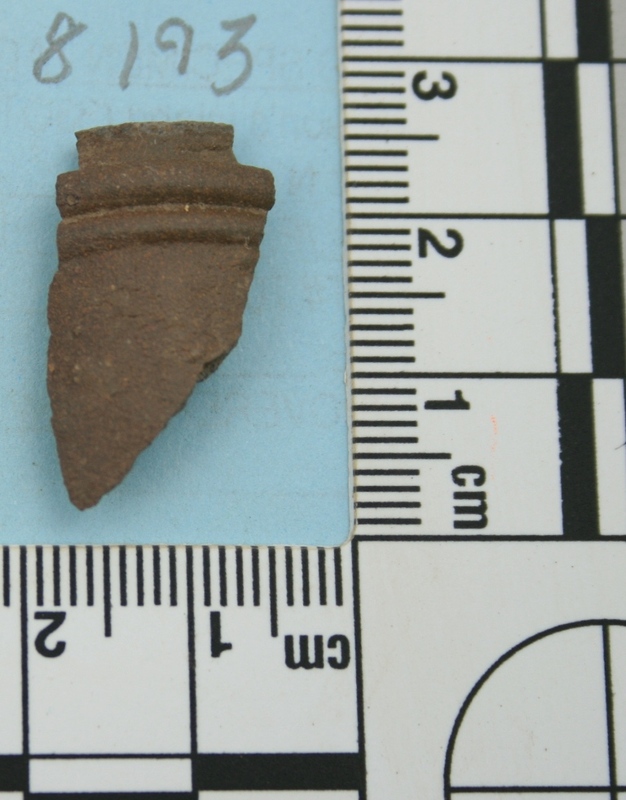 Although we could not find an example that was amber colored or with an F embossed on it, it appears to be from the interior plunger of a syringe. The numbering system we use for our cultural material has been used for 20 years now. Originally the site was assigned the catalogue number 704, referring to Johnson’s Island. The number 1 following that number refers to the Field Specimen catalogue we have developed for this site. All subsequent numbers are specimens felt to be significant enough to warrant their own identification number and storage bag. Therefore, the number 704-1-7297 refers to the FS 7297 pictured. 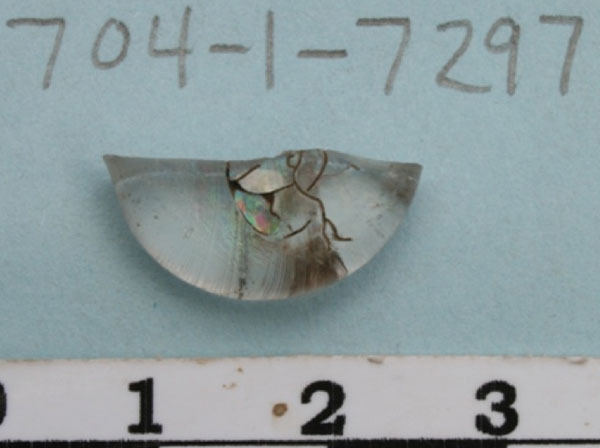 This item is made from clear glass, circular in form and flattened, thus it is not half a marble, but is more disk-shaped. Any thoughts on what this might be are more than welcome. Although we have found many items that we can identify, there are those few that elude us at present and FS 7309 is another one of them. It is made of copper with an edging of what appears to be silver. The silver edging is only on one side. It looks like it might be part of a sieve of some sort, but currently we have no interpretation of its use. We have found several more pieces of this in the last year of the Block 6, hospital, excavation. 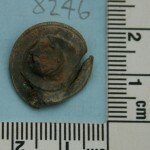 One new object (FS8246) I believe is made from Pewter. As you can see from the picture, there is a threaded object which appears riveted into the ?top? of the piece. There is some decoration along the edge, so it appears to be part of something else. Any thoughs would be very helpful. 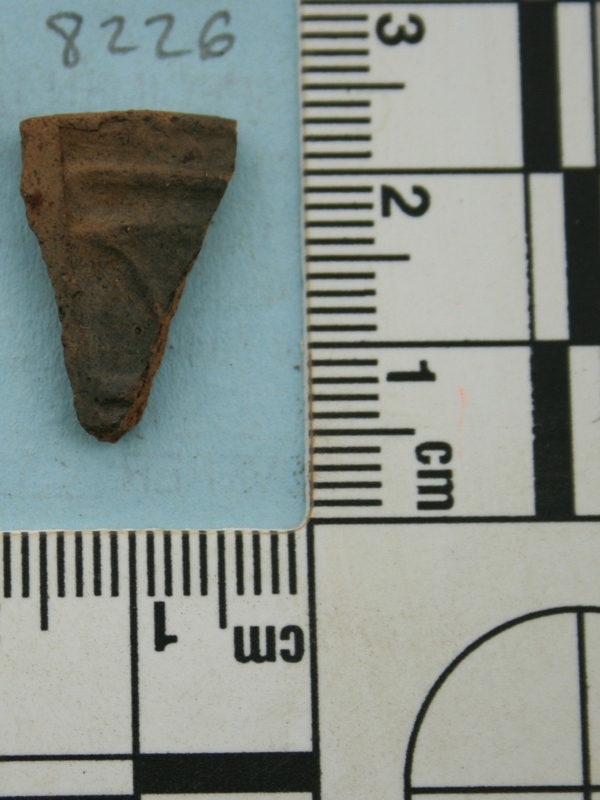 The next two objects below are two redware smoking pipe bowl fragments. They are FS8226 and FS8193. I have never seen this design before and would love some information on them. If you can provide an image of the entire smoking pipe, or other relevant information about these pieces, please let us know. Thanks for your interest. The ideas posted to the old bulletin board have now been listed here, thanks to all who participated! 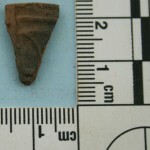 The first artifact (FS 4097) is something that has been discovered several times at Johnson’s Island. It is made of copper, quite thin, and has been discovered in a couple of different sizes. It has a bit of a spring to it as well. a spring from a rifle’s fire-control mechanism? a spring for a drawer slide? The correct answer is that this copper object is part of a lighting lantern. It helps to hold in place the lamp’s chimney. arch support for a boot? The second piece is hollow and made of bone (FS 3902). It appears to have been a small cap over something. Of course, I am not sure what it may have covered. We have found three or four of these at the site. the cap to a gun powder flask, can, or horn? a piece for a chess set? The third object appears to be porcelain. All but the bottom is covered with a clear glaze. This is the only one of these that we have recovered from the site. water or feed dish for a bird cage? This is the correct answer. With respect to the third object of porcelain: perhaps this is a tavern or barracks style inkwell. 1. the artifact is intended to be stable and it may be anchored to a flat surface as well as fit into a wooden rabbeted plank. 2. the artifact is of a shape and material that suggests it is designed to serve as a resevoir for a liquid solutions whose properties must not be affected by its container. Porcelain would be ideal in this case. In regards to specimen #3 it is definitely a food dish for a bird cage. I have several of these in my possession – also in white glazed porcelain, that are nearly identical- and the exact dimensions shown in your photo. These were made well into the 1930’s. I do not know how far back they were produced – it is possible that the piece may be a contamination of the site – as there were many inhabitants on site post civil war- including Italian immigrants working the quarry who had a fondness for birds as pets. It is possible too that prisoners may have built cages and kept small finches, etc as pets. The holder was pushed between the bars of the cage and stuck there between the indentations on each side of the trough – the lip is for a person to grip the dish and pull it out. The ones I have were used by my Grandmother in the 1930’s when she raised canaries. I can forward a photo of the ones I have if you like. I agree, specimen #3 is most likely a food dish. Specimen #1 looks like it might be part of a piece of furniture or some kind of tool. We visited the prison site perhaps 20 years ago. It is our habit to find places of interest, off the beaten path. This one was just stumbled upon….”Stop. Turn the car around”. Thank you for your intense respect for what is a little known aspect of our Civil War. Keep those reports coming and also those mystery items. 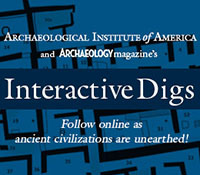 Finding out what the item is you have dug up is as much fun as digging it up. It’s amasing what you can discover about artifacts by just visiting you local private collector museum, you don’t have to be a university graduate to know about history and what artifacts were used for. I have no proper training in this field but have been an amateur historian and collector for many years. Most of my collection comes from artifacts I’ve found when working on earthmoving jobs in our area. If it wasn’t for me these pieces would be lost. I pick them up and notify the local museum (experts) that they are in my collection. I’ve become good at working what some items were used for. I also enjoy reproducing bone and antler items used by the old people in europe, vikings and pre-iron age . Keep up the good work and enjoy your history. FS8246 – Perhaps a finial from a lid of some kind, ie teapot or storage canister? FS 7297 – Perhaps a ‘burning glass’, ie a lens used for focusing sunlight to start a fire. FS8193 -Is that pipe carved from the widely used Native Amerian red pipestone of Pipestone, Minnesota? If so, the designs and shape of pipe bowl varied by tribes who used it. 4907–spinner to a gaming board? 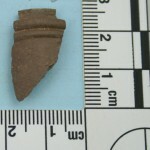 These pipe bowl fragments are not carved from pipestone. They are made from redware clay. When I looked at the plunger, I saw to me what looked like not just F, but Fe. Were they using chemical symbols back then? I love this site, i just bookmarked it. Yup, I’m with David on the bowl fragments. Looks like red clay to me. Object FS 7309- tea infuser ? Artifact FS 7309 Appears to me to be part of the inside of the old handwarmers sold during the late 50’s 60’s. Cotton with lighter fluid inside the strainer conainer, that fit inside the crome plated handwarmer. Usually sold with a red cloth material bag to fit over whole unit. Artifact 8247; possibly a glue or paste pot lid with brush/applicator attached (and now missing)? …or inkwell top with housing for cork stopper remaining. …and of course I meant to type in the numbers artifact 8246, not …7. sorry. I was actually the kid who found that artifact. 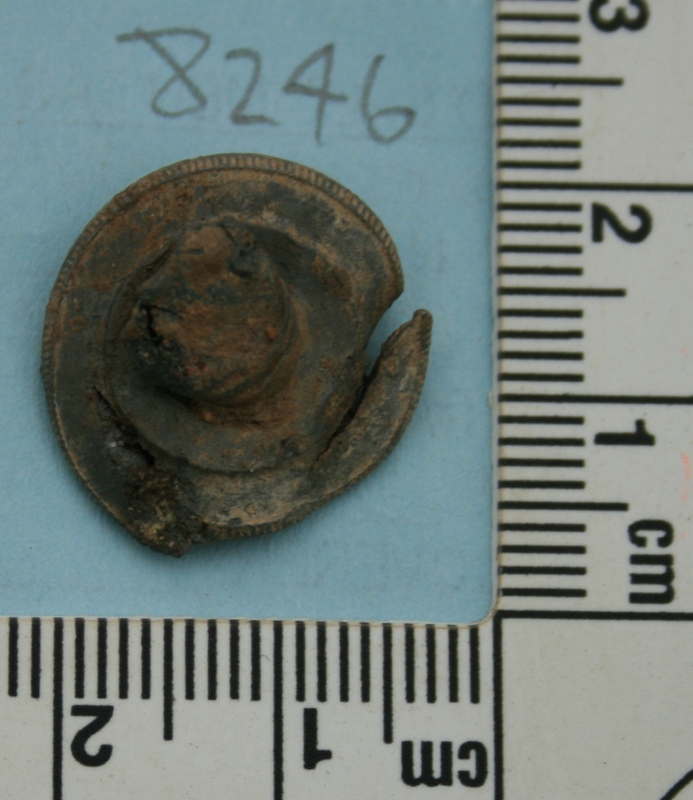 To me, it looked like a sort of button with a screw lodged into it. If you ever do find out what it is, could you please let me know? Dear Friends – congratulations on your exciting discoveries. Many years ago, my father (RIP), Ralph John Steffen told me the story of one of his Great Uncles that had been captured during the Civil War and how he had died in a Confederate Prison near the end of this war between the North and South. It may be my imagination, but is there a small indentation in the middle of the top edge? Could that be where the button’s hole was? Could 7309 be a medical instrument tray? Some modern day trays have small holes in them. Also the raised edges look like a tray. Might it be the top to a candlestick? Often the drip pan with it’s socket came away from the candle stick itself. The ones I have seen were not threaded but they have looked a lot like your photo. FS8246 reminds me very much of old woodworker’s plane or drill handle. The visible side was obviously not meant to be viewed, or at least in full, as the decorative part is only around the rim. 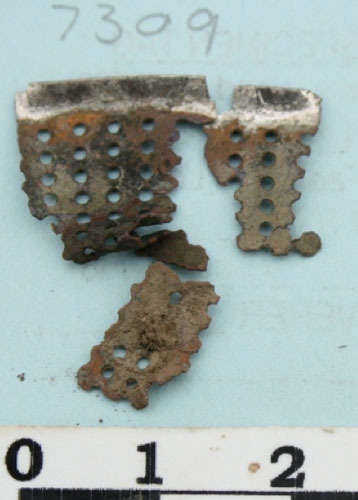 There looks to be a decay pattern where the very edge of the metal was exposed to elements for longer than the central parts, furthering the suggestion that something was seated on the threaded section at one point. But the pewter part throws me. It makes me think more like the seam of something, like weights in a billiard cue, as obscure as that sounds. 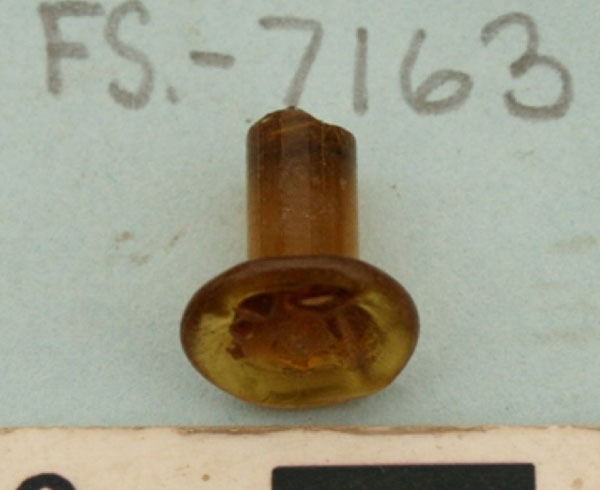 FS 7163 looks like a glass bottle stopper with the bottom broken off. Looking for my great grandfather’s transcribed diary of when he was imprisoned at Johnson Island. It is an 80 pages of his stay there. This document should have been sent to you from the Museum in Kennesaw, GA. Do you his this? Please respond as soon as possible. I would like come for a visit. Would it be possible to place the unknown artifacts near a ruler or some other item that would allow us to have a reference to it’s size?